From their favorite novels to favorite films, it’s the preferred theme for consumers. But perhaps the last place they seek it is with their favorite airline. Unfortunately a quick scan of the latest news about aviation reveals an industry spotted with bankrupt businesses from America to Zimbabwe. Nowhere is the drama deeper than in Africa where several nations are without national airlines. The epitome of the continents’ myriad struggles is found in one of its leading countries: Nigeria. Despite an upwardly mobile population with overwhelming travel needs, the West African nation has had difficulty retaining domestic and international airlines. Virgin Airlines tried to enter the market in 2004 only to beat a hasty retreat in 2009. Their planes were promptly bought and re-branded Nigerian Eagle Airlines. That venture soon failed, prompting another re-branding as Air Nigeria, a brand that continues to struggle for stability in the market. This story mirrors the dozen plus airlines that have entered and left Nigeria, leaving its industry in a permanent state of flux. It was founded in 2006 by Sir Joseph Arumemi-Ikhide, a business magnate, with a strong desire to promote a different image of his country’s aviation industry. He launched Arik with the purchase of two Bombardier CRJ aircrafts which flew between Nigeria’s two major cities– Lagos and Abuja. It was a brilliant move that capitalized on a huge business opportunity: over six million and counting annual domestic flyers. It’s no wonder then that in rapid succession, the airline expanded from two jets to 23 aircrafts, over 1,500Â staffers and the distinction of being one of an elite number of airlines around the world to employ Lufthansa Technik AG for independent maintenance of their aircrafts. 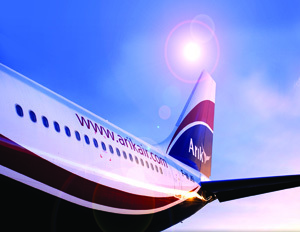 In the process, Arik has risen to become the market leader in Nigeria with 63% of the market share.